What exactly does this sign mean? It appears in more than one place and this one isn't even on State Wildlife land! I’d suited up and was headed out for a ride up Buckhorn Road, but when I got down to Hwy 550, I ran into Glenn Neigenfind, who said he was riding up County Road 4 to investigate a road. The road was marked with the sign shown in the picture, but the odd thing was that the sign is a Division of Wildlife sign, but is not located on Division of Wildlife property. Plus, the same sign is used in other places clearly meaning “private property on both sides of road, stay on road.” So what did this sign mean? I asked if I could tag along; he agreed. Here's the BLM map feature that intrigued Glenn. What had caught Glenn’s eye was the BLM map, which showed a road jutting to the south from County Road 4 that might be a public road. It was that road we went looking for. Click on image for larger version; user browser "back" button to return. 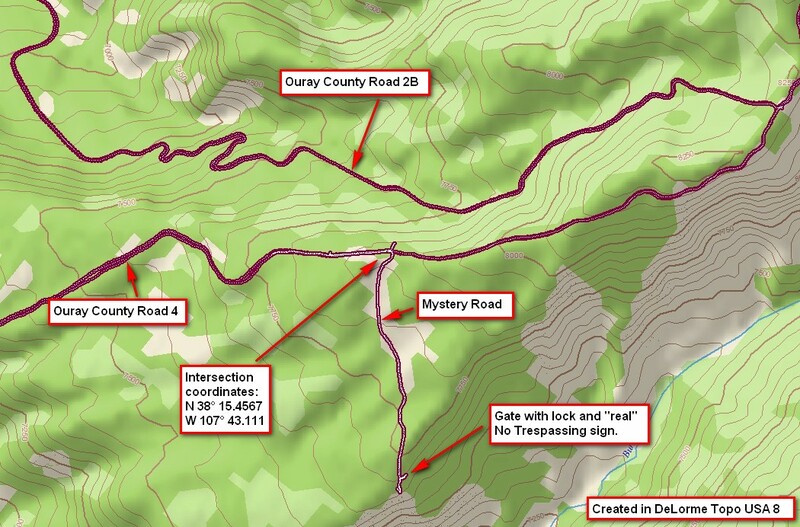 This map shows the location of the mystery road. We traveled from the intersection down to where there really was a "no trespassing" sign, where we turned around. The map above shows the location of the road. Here’s a 90° panorama showing County Road 4 going straight and the mystery road to the right. As you can see, it’s well traveled and there’s no gate or fencing near the sign. At first we thought this might be the road on the map. 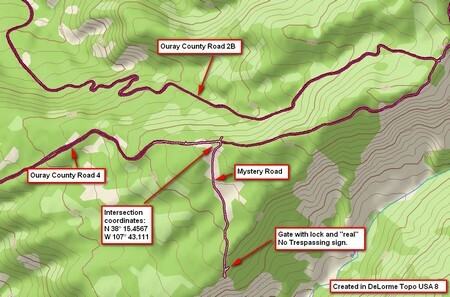 Here's where the mystery road takes off to the south. Click on the image for a larger version. Use your browser's "back" button to return. The road slopes down and almost due south for about 3000 feet (1000 meters) and suddenly turns west. And there we found a far more convincing indication of private property: a gate which, although open, had an unlocked lock hanging from the post. 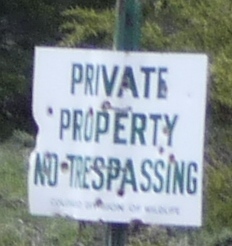 This clearly was private property and of course we opted not to go on. Plus, it was clear from my GPS track that this road’s contour did not match the mystery road on the BLM map. We concluded the map was in error. Here's what we found at the bottom of the road. The view at the left is to the east; this 90° panorama shows south at the right. Well, now we knew. The road was in essence a “driveway” down to the entrance to some ranch land. It doesn’t have any particularly good views, so it’s probably worth skipping. But…alas…there’s more to the story! Glenn had battery problems. Fortunately he had a tow strap. 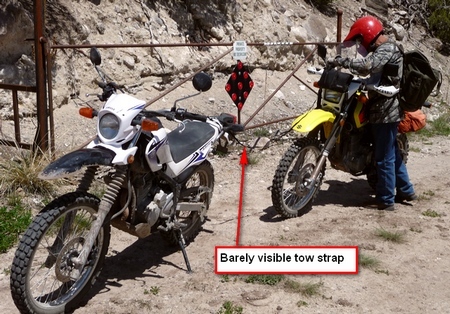 I towed him back up the hill—a distance of 3000 feet—with my little Yamaha XT-250! While we were reconnoitering, looking at what view there was, and, of course, swapping stories, Glenn’s battery ran down. Fortunately he had a small tow strap. We hooked it to my Yamaha XT-250 and I towed him up the hill in first gear, a distance of 3000 feet and an average of a 5.5% grade. Once we reached the main road, I expressed my utter astonishment that my little 250cc bike was capable of such a feat! It took Glenn about a quarter mile coasting down County Road 4 to restart his bike. After that it ran fine! From there we headed to Buckhorn Road to see what we could see.